A top down raglan sweater embellished with feminine quilted detail can be dressed up or down. 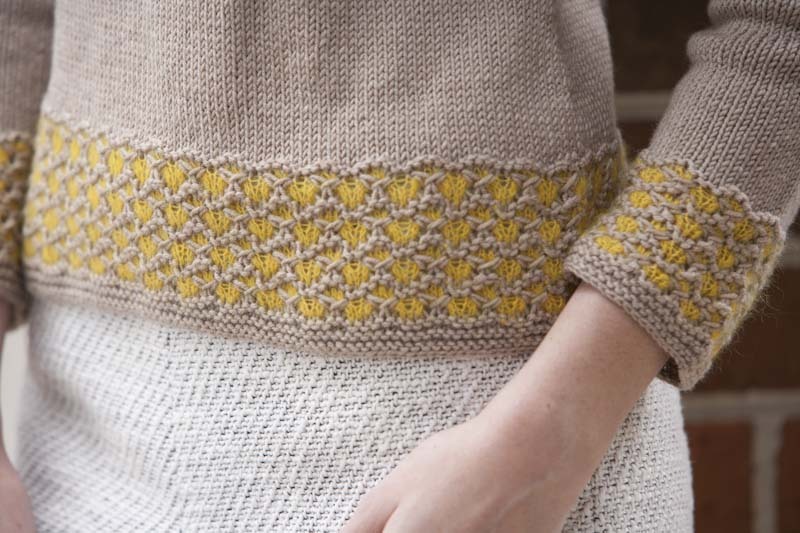 An indulgent laceweight gives gauzy texture to the lace panels in this pretty pullover. Use a bright yarn for a pop of color, or try tone-on-tone yarn for a subtler look. Finished Size 31¾ (33¾, 38¼, 42½, 46¼, 50¾ )" bust circumference. 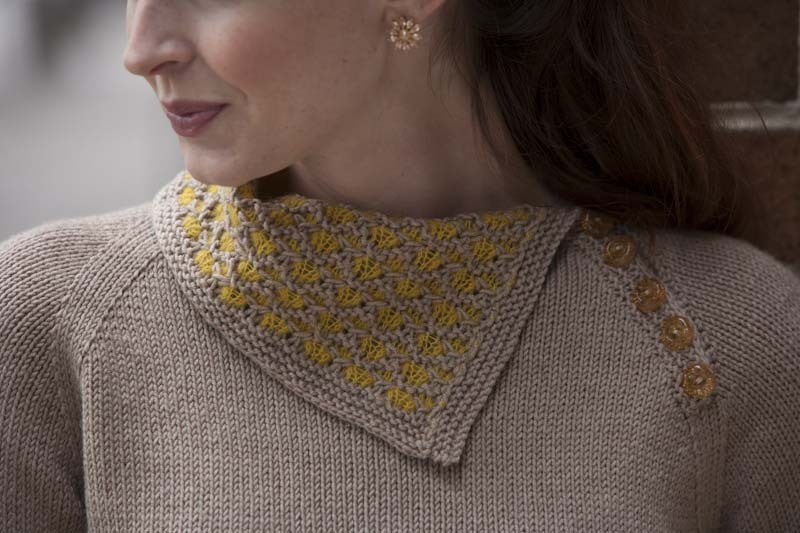 Pullover shown measures 33¾", modeled with minimal ease. Yarn Filatura Di Crosa Zara (100% extra fine superwash merino; 137 yd [125 m]/1¾ oz [50 g]): #1773 latti (MC), 9 (9, 11, 13, 15, 17) balls. Filatura Di Crosa Golden Line Superior (70% cashmere, 25% silk, 5% extrafine merino; 328 yd [300 m]/⅞ oz [25 g]): #62 mango (CC), 1 ball. Yarn distributed by Tahki-Stacy Charles Inc. Needles Size 6 (4 mm): 32" circular (cir) and set of double-pointed (dpn). Adjust needle size if necessary to obtain the correct gauge. Notions Markers (m); waste yarn; tapestry needle; five 5⁄8" buttons. Gauge 23 sts and 30 rows = 4" in St st.